At the BLCRC Annual Meeting last November, the members voted to finance a 30x50 activity center on 1 1/2 lots in the center of the community. 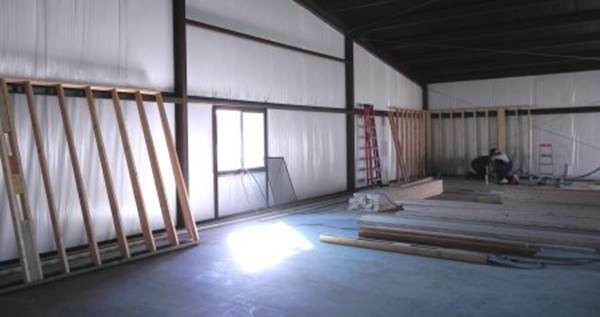 This is a blog by Kirk Wood about the construction of this building. 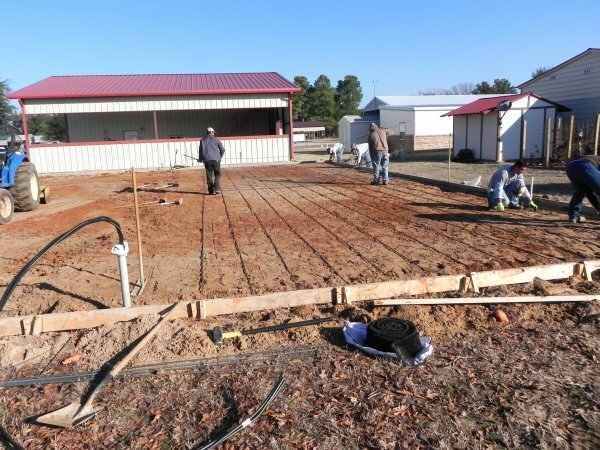 About 8am on Monday, Jan. 21 the crew arrived to put in the forms for the concrete pad and went to work. The work began with the spreading of the dirt from last week. There was a crew of 10 men who went to work with tractor and shovels, hammers and nails. An additional two more trips with the truck for more dirt were called in, adding another 74 cubic yards of fill. It is amazing just how much dirt it takes to raise the pad area by one inch on the high side and perhaps as much as three of four inches on the lowest corner. After the dirt is spread the crew began to dig the foundation trench and footing locations with shovels, as others were constructing the forms. Looking around the area one wonders if we might need seating for the crowd that gathers to watch the work progress. Shortly after noon the work was pretty well complete. 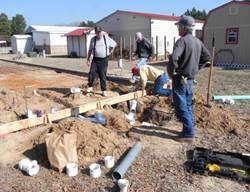 The crew here began to collect the plumbing supplies and get things ready to install the plumbing under the pad before concrete is poured. 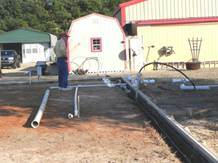 We managed to use a large amount of pipe and supplies from the surplus stored in the tractor shed. 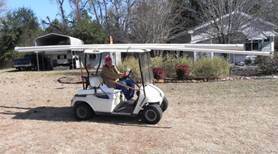 Tom’s golf cart was pressed into service as a pipe truck. Tuesday morning we began the job of digging in the plumbing which must be under the building pad. First it was all laid out on the ground to see where things must go, then the digging began. If you have never worked with sewer plumbing, it is critical that the slope be correct with enough but not too steep. Of course it also involves a large amount of digging, cutting, and gluing. Figuring out just where each item must be to line up with the interior walls, restroom facilities and sinks it time consuming but with lots of help, the job was completed in one day. Our thanks to the crew who helped on the project thus far. Walt Massy, Tom Abrahamsen, George Ament, Bill Crownover, Keith Shipman, Rich Dixon, Cal Jones, James Barnwell, & Kirk Wood. More pictures to come on Thursday! About 6am our community was awakened to the sounds of construction workers preparing for the pouring of concrete for our new building. For me, the discovery was the rumble of a ready-mix truck passing out front just as I was taking my first drink of morning coffee! 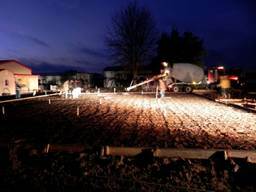 Heading over to lot 305 I was amazed to see a beehive of activity, all using the light from vehicle headlights and the first load of concrete being backed into place to start pouring. Looking about, I saw Keith Shipman also approaching from his house and soon after Tom Abrahamson also arrived on scene. Very soon most of the men in the community were out to watch the show. It was a very impressive site, and the crew seemed to work hard and to be very good at what they do. The first truck began to empty its load by about 6:45am and before very long it was a traffic jam of trucks waiting to empty their contents into the forms. Workers swarmed the site and concrete was being dispensed, leveled, and tamped into the forms as an amazing pace. As the sun rose the pace seemed to increase and work progressed rapidly. As quickly as one truck was empty it was replaced by another, with not one moment of rest for the workers. There were five loads in all and by 7:30 am all were empty or waiting in line. Everyone present agreed that the choice to hire this work done was a prudent one as people our age and physical condition are clearly not up to the work being done! 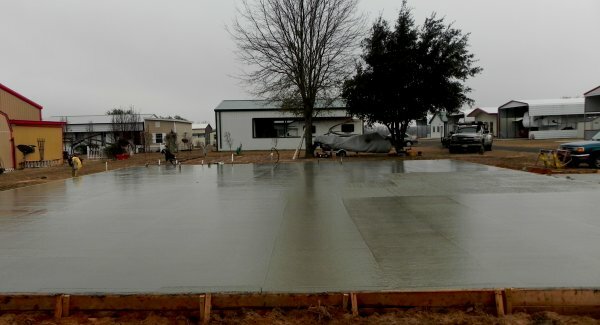 By 8 am the trucks we gone, the concrete all spread and leveled and the crew were resting from the hard work accomplished. The next step was simply to wait for things to begin to harden. About 9:30 am the trowelling crew began their work. There were workers all around the edges who did trowelling by hand while two power trowels were also put to work, beginning at about 9:30 am. 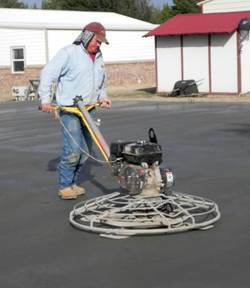 The crew consisted of about a dozen workers at the start, then when pouring was complete, five of them stayed to do the finish work. Trowelling was done over and over as the material hardened to a point where we lost count the number of times that it was done. Each time over the operator would watch very closely and small flaws were repaired by workers with hand tools, followed by another pass with the machines. This process continued throughout the afternoon. The crew also removed the forms and worked the edges in breaks between times over with trowels. We marveled at the amount of hard work and skill displayed by the workers and their willingness to do things requested by our key people, such as truing up any pipes extending above the pad or any other request. The workers were friendly and courteous, although English was in rather limited use. By 4 pm the crew had loaded up the equipment and were on their way home. The weather was perfect for the big day and all went very well. It was clearly a day to be thankful to our Lord for all that it brought to our community! Today, January 25, 2013 the first event took place in(?) our new building at 2 pm, with afternoon coffee. While the weather was drab and chilly, the attitude was sunny and warm! On Thursday, Feb. 7 we heard the sounds of trucks as the construction crew and materials arrived at the new construction site. Very quickly the crew was hard at work, first with the unloading process and soon they began laying out the materials for work to begin. Soon the erection of the framework was begun. Even with the chilly, cloudy day there was a steady stream of observers, board members, building committee and nearly everyone here made regular trips to observe the progress. It was an exciting day and good progress was being made. 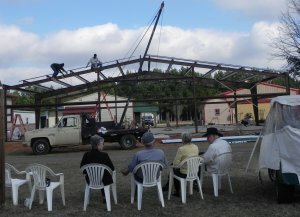 As the day wore on we were amazed by the speed with which the frame of the building began to rise. The crew seemed to get rather a chuckle from the observation gallery that developed as the day warmed. As evening neared the framework reached competition and work for the day came to an end. Early the next day, Friday, the crew was back to start the installation of the walls. With weather less friendly there were fewer hardy observers, but most of us continued to pass by regularly to make note of the progress. The crew clearly know what they are doing and have worked together many times. I found it fascinating just how little communication was needed as each one seemed to have specific tasks and each knew what all others would do next. By evening on Friday there were two walls completed. Monday morning the crew returned to continue work. They worked quickly and very quickly more walls began to rise. Weather was threatening, but the crew stayed with the job even with a few sprinkles falling. By noon all four walls were up and the crew broke for lunch, but weather was not with them and before they returned rain was falling and it was too wet for work to continue. As of today it continues to rain and so we have four walls, doors, and windows but work is held up until further notice. We need the rain and so everyone here is trying to be patient with things, but we also continue to watch the weather reports, anxiously waiting for work to continue! The new building is now weathered in and we have the keys! But all did not go without any hitches. Yesterday the weather improved and our workers returned, making very good progress. By evening the roof was on and about all that was left to do was the installing of trim, eves troughs, and down spouts. Or so we thought! Once the crew left, many of us went inside to look about. At some point, several discussions came up about how the kitchen was to fit, and fortunately, Tom & Donna became curious enough to measure and one front window was in the wrong location! Tom was soon on the phone to Athens Buildings and it was soon determined that there had been a mistake. As soon as the crew arrived this morning, work began to relocate the offending window and make things right as the plan called for . As the saying goes, all is well that ends well and by 3 pm our building was complete and the crew was heading down the road. That began a steady stream of observers to check out the building. Several folks joined forces to sweep up some standing water from the rain and a bit of trash. Mostly we just rejoiced in the competition of the next step in our community’s new building. Tomorrow we go to Lowe’s to pick up construction materials, and the next step in construction begins. Speaking of which, based upon legal advice, we are asking all members of our community who plan to be involved in the work in our building to sign a “hold harmless” form before we begin work. There are two ways that this can be done. Attached is a copy of the document which you can print out and sign, then return it to either Tom or myself. If you do not have a printer or prefer to do so, you can contact me over the next few days and I have printed copies which you may sign. We need both husbands and wives to each sign one if they will do any work on this project. The work day began at 8am with a prayer for guidance & safety for all, as does each work day. With a break for coffee at 10, lunch break for an hour at noon and coffee again at 2pm good progress was made. There were 12 men working on the construction. Wives have contributed goodies for breaks and cold drinks and several folks stopped in to lend encouragement. This is truly a community project and everyone is welcome. Come by and work if you are able, or just visit and lend moral support if you are not. The day began with the competition of setting all of the ceiling joists for the bathrooms & kitchen. As the crew completed that work, all of the work tables and the chairs for observers and coffee brakes were moved into the kitchen area. 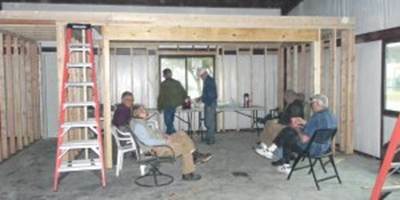 At 10 am the construction break became the first activity to be held in our new community kitchen! Nothing fancy as yet, but how could it ever be more homey? As that was happening the first stages of construction began for the framing of the 12’ sidewalls, starting on the center bay of the north wall, and continuing on to the west wall. Fitting things around the steel of the building’s framework can get rather interesting in places and with lumber lengths in standard sizes that never quite fit, there was a lot of noise and sawdust in the air as each section of wall was first constructed on the floor, then set upright and maneuvered into the proper location and attached to the floor and to the steel building frame. By day’s end, more than half of the 12’ walls had been framed. 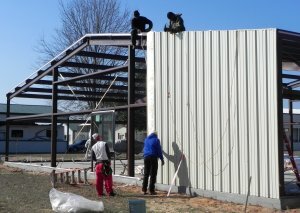 Tomorrow will be a short day, but we hope to complete the framing of the outside walls and to get started on the electrical work. On Friday, February 22 the first official event to be held in the new BLCRC rec hall took place! We took our monthly cake & ice cream gathering for celebration of birthdays and anniversaries there for the first time. It was really pretty nice and sure is convenient to our homes for such events. We had a good turn out with 34 people in attendance. 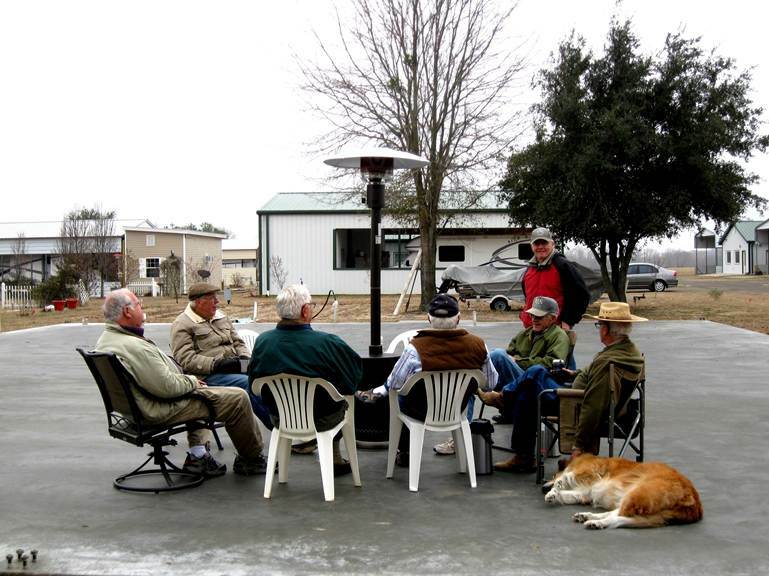 This was a “bring your own chair” event, but nobody seemed to mind. The construction continues to progress very well and things are moving far ahead of our first projected schedule. In fact, the current takes are on the schedule for March 4 – 8. It seems that most of us are so enthused that we are anxious to get busy each day and want to stay until the current task is finished. To date we have had groups of workers from six to eighteen men at any given time, with most able workers spending as much time on the job as their schedules allow. 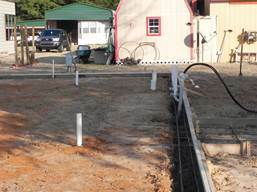 Next week the decking of the area over the restrooms and kitchen will be completed and the air handlers for our heat pump system will be placed. Wiring of the electricity has begun and power is available inside. The wiring will be continuing and the last of the framing will be completed. At this point, it is difficult to predict exactly where we will go next or just when it will be complete, but it won’t be long before the sheetrock will start to go up! One of the great things about the project is the way that so many of us have developed much greater friendships as well as getting to know each other much better, though sharing this work project. God has been very good to us all!